Wash the blackcurrants and remove them from their strings, using a fork. Boil the water with the sugar until obtaining a syrup. Add the blackcurrants and boil for 5 minutes on a low flame. Cover and allow to macerate for 10 minutes. Filter through a sieve, pressing the currants. 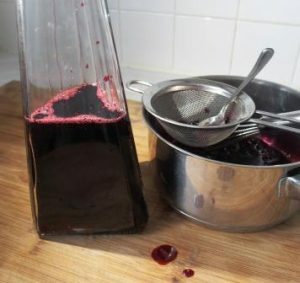 Pour this blackcurrant cordial into a bottle and cool down quickly in the freezer – ready for use, topped with water, sparkling water, lemonade or in other recipes.